District 1 City Council Member Joyce Morgan is your “Consistent Voice for Arlington”. Since being elected in 2015, she has broken down barriers of transparency in government and brought City Hall directly to the neighborhood, through informative and constituent-friendly monthly town hall meetings. She maintains a hands-on approach to collaborating with potential investors and developers. Morgan’s passion to combat blight, is demonstrated through her charge that encourages monthly clean ups in Arlington. Morgan uses open dialogue with law enforcement in creating a culture of partnership and respect. Through the Sheriffs Watch meetings each month and regular meetings with Sheriff Mike Williams she works toward strategic solutions to crime in Arlington and across the City. Currently, Morgan serves as Vice Chair of the Finance Committee and as a member of the Neighborhoods, Community Services, Public Health & Safety committee. She also serves on the Juvenile Justice Advisory Board, the Keep Jacksonville Beautiful Commission, and the Public Service Grants Council as well as the Value Adjustment Board, the Personnel Committee, and is the liaison for the Sister Cities organization. In 2015, Morgan’s leadership was immediately recognized as a newly elected City Councilman. Her first year, she served as the City Council Floor Leader. Morgan’s uncompromising leadership garnered her the “Charles D. Webb Award”, the City Council’s most prestigious internal award, bestowed annually by the outgoing President. Her second year she was appointed as City Council Chaplain. First coming to Jacksonville in 1988, Morgan was a television personality in Atlanta and Macon, Georgia, and then here in Jacksonville at Channel 17 (WJKS). She departed for a short stint in Dallas but returned to Channel 4 (WJXT). She has been a lifelong community servant using her communication and public relations experience to work and volunteer with dozens of organizations. She is a member of Alpha Kappa Alpha Sorority Inc. and has a host of honors ranging from– media awards to Girl Scouts Women of Distinction. Morgan is married to Dr. Richard Danford, Jr. CEO of the Jacksonville Urban League. They have three children, Faith, Morgan, and Richard Danford III. Joyce and her family are members of Bethel Baptist Institutional Church. The “Consistent Voice for Arlington” IS Joyce Morgan, District 1’s City Council Member. Elected as the NEW Voice of Arlington in 2015, she has delivered on her promise to break down barriers through transparency in government and has brought City Hall directly to the neighborhood, through informative and constituent-friendly monthly town hall meetings. Her hands-on approach to collaborating with potential investors and developers addresses the overall vision of revitalization to the district. Blight in Arlington neighborhoods continues to be a priority as Morgan. She has initiated and participates in monthly District clean ups. She remains committed to supporting the City Council strategic initiative that calls for a comprehensive and coordinated policy on blight and litter citywide. She maintains an open dialogue with law enforcement, thereby creating a climate of partnership and respect, citizens and police are invited to collaborate at the Sheriffs Watch meetings each month. Morgan also hold meetings with Sheriff Mike Williams in search of strategic solutions to crime in Arlington and across the City. Currently, Morgan serves as Vice Chair of the Finance Committee and as a member of the Neighborhoods, Community Services, Public Health & Safety committee. She also serves on the Juvenile Justice Advisory Board, the Keep Jacksonville Beautiful Commission, and the Public Service Grants Council. Morgan has additional duties on the Value Adjustment Board, the Personnel Committee, and is the liaison for the Sister Cities organization. Under Morgan’s tenure, a 2.5 million-dollar swimming pool will be constructed at Blue Cypress Park as well as the search for new management of the golf course. JTA is investing 2.5 million dollars in a high-tech roundabout designed to calm traffic and promote safety, a million-dollar rowing center is being built in District 1, Façade Grants are being offered to businesses within the Renew Arlington Community Redevelopment Area to help revitalize their space. In addition, she has secured a million dollars in future funding for Arlington’s Norman Studios which is on the National Historic Registry. Her tireless work with schools, churches, non-profits, and other community organizations is unparalleled in helping to inspire and shift the momentum of the District of one from hopelessness to HOPEFUL! That hopefulness and inspiration was recognized by her colleagues as well. When first elected City Councilman, she served as the City Council Floor Leader. Morgan’s uncompromising leadership garnered her the “Charles D. Webb Award”, the City Council’s most prestigious internal award, bestowed annually by the outgoing President to the Council Member that best exemplifies extraordinary commitment to public service. Her second year she was appointed as City Council Chaplain. Coming to Jacksonville in 1988, Morgan was a television personality in Atlanta and Macon, Georgia, and was a news anchor here at Channel 17 (WJKS). 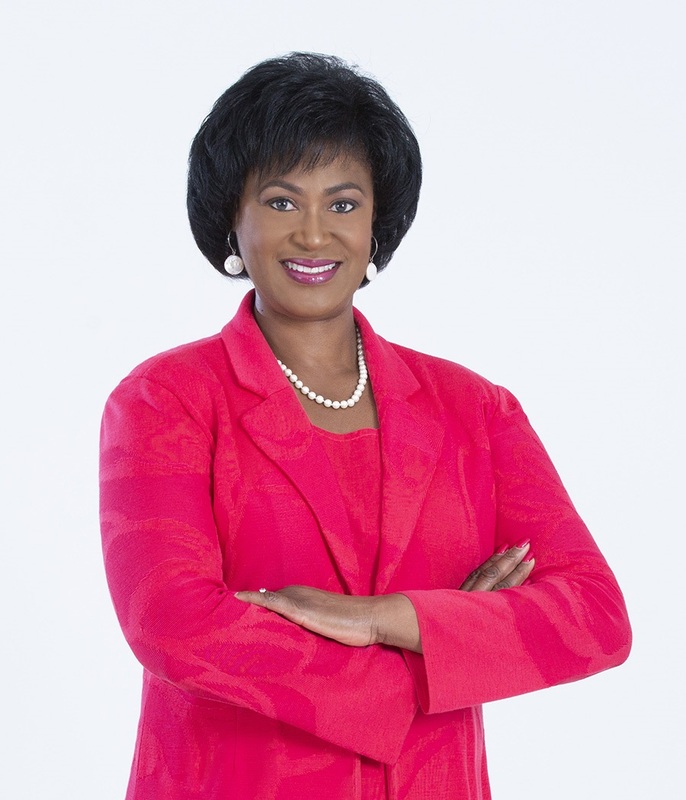 She departed for a short stint in Dallas but returned to Channel 4 (WJXT) becoming a media staple since 1993. Her nearly three decades in broadcasting have helped sharpen her knowledge and understanding of what is essential to a strong community and city. She has been a lifelong community servant using her communication and public relations experience to work and volunteer with dozens of organizations. She is a member of Alpha Kappa Alpha Sorority Inc. and has a host of honors ranging from– media awards to Girl Scouts’ Women of Distinction. Morgan is married to Dr. Richard Danford, Jr. CEO of the Jacksonville Urban League. They have three children, Faith, Morgan, and Richard Danford III. Joyce and her family attend Bethel Baptist Institutional Church. Joyce is poised to serve District 1 (four) 4 more years. Morgan is poised and ready for the next 4 years.